chef-quality meals ready in just minutes. Tender chicken breast in sweet garlic teriyaki sauce with jasmine rice. Tender chicken breast in a rich and creamy Thai curry sauce with jasmine rice. Tender chicken breast glazed in a sweet & spicy kung pao sauce with Asian vegetables and jasmine rice. Tender chicken breast in creamy parmesan and garlic Alfredo Sauce with penne pasta. Fork-tender beef medallions in a rich mushroom-wine sauce with penne pasta. Tender chicken breast in creamy tomato, garlic, and herb sauce with parmesan cheese and penne pasta. 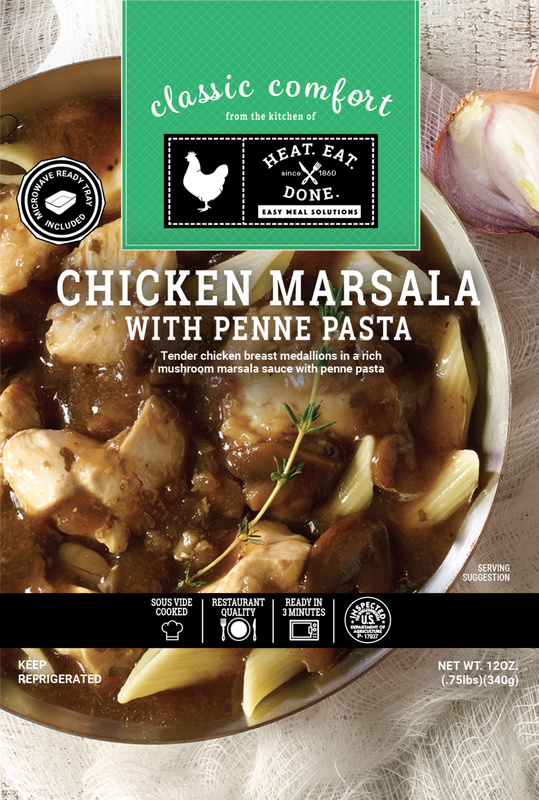 Tender chicken breast in a rich mushroom marsala sauce with penne pasta. Rustic tomato and garlic Beef Bolognese sauce with cavatappi pasta. Tender chicken breast in marinara sauce with fresh herbs, garlic, and onion with penne pasta. Enter your email address below to keep informed on promotions, new products, and other exciting happenings!